Mercedes-Benz (German pronunciation: [mɛʁˈtseːdəs ˈbɛnts]) is a brand of cars, trucks, buses and coaches from the Daimler AG company of Germany. The company was once known as Daimler-Benz and is still sometimes called just "Mercedes." Mercedes-Benz is the world's oldest car maker and the cars they make cost a lot of money. The symbol of Mercedes-Benz is very famous. 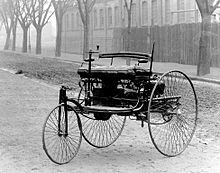 It is a three-pointed star inside of a circle and was designed by one of the men who started the company, Gottlieb Daimler. The three points of the star stand for land, air and sea because Daimler's engines were used not only in cars and trucks but in airplanes and boats. The symbol was first used in 1909. Mercedes-Benz sedan of the 1970s. This is the "S-Class," the most expensive model at that time. This page was last changed on 14 September 2018, at 14:44.